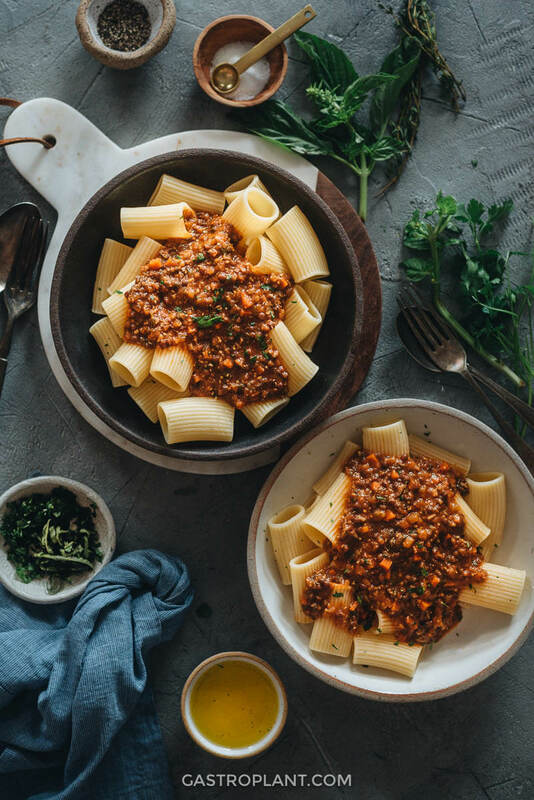 This Vegan Bolognese sauce is a plant-based take on the classic red pasta sauce. 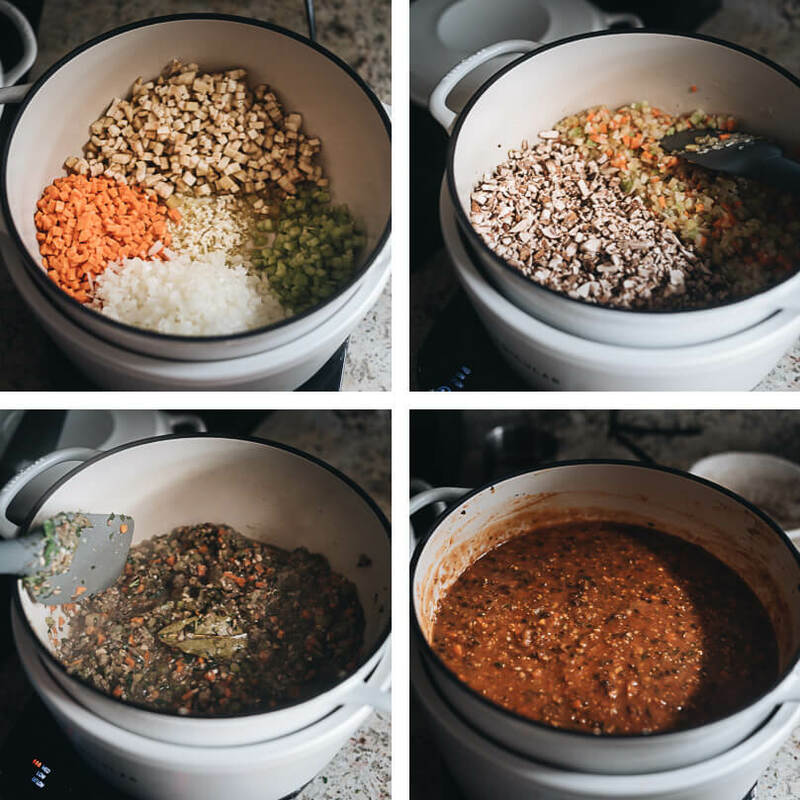 It uses a variety of veggies, lots of fresh herbs, mushrooms, and lentils to unlock a ton of flavor. The texture of the sauce is thick and meaty enough to coat whatever pasta strikes your fancy. I grew up eating two main types of red pasta sauce. If my parents were feeling up for the task, they’d make a giant stock pot of a meaty bolognese with mushrooms. Much of that would get frozen and we could bring it out for several meals over the next month or so. If they were in a pinch for time, though, we’d almost always have a jar of Classico brand sauce with mushrooms. 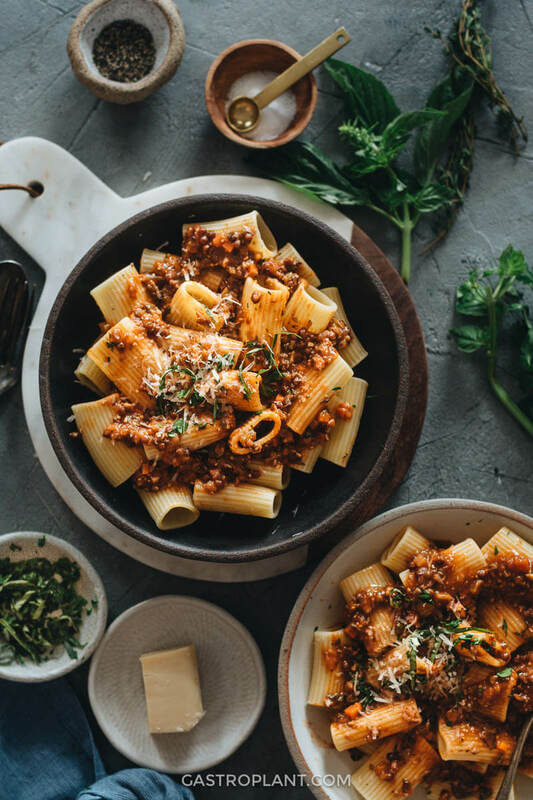 Though it may not be part of a classic bolognese recipe, mushrooms just always felt right in the sauce. I realized this at the age of ten when I was invited to go camping with some Boy Scouts for a night in the woods. The host troop was gracious enough to serve us spaghetti for dinner. Being the young food critic that I was, I called them out on their Ragu brand sauce, which tasted bland to me. (I didn’t understand the rudeness of my matter-of-fact statement until my dad informed me of it later. Super embarrassing.) I didn’t know that it was the mushrooms that were lacking at the time, but now I can totally see how I could have found a mushroomless sauce bland. When I was coming up with this recipe, there were a few different goals. The first was to make a delicious tomato-based sauce with the right consistency, emphasis on the word delicious. If it doesn’t taste good, it’s not worth sharing. I also wanted to use a wide variety of vegetables to make the sauce especially nutritious. And the sauce needed to have mushrooms, because of the important lesson I had learned as a kid. 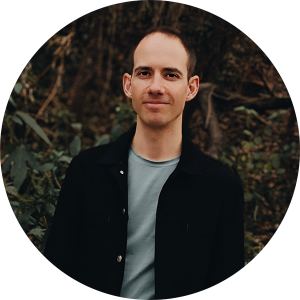 With these goals in mind, I checked out a couple of recipes, including an omnivorous one from an Italian cooking site and a vegan one from Serious Eats. I got some ideas about how simple the sauce could be from the former, as well as how complicated it could be from the latter. I went for something in between. 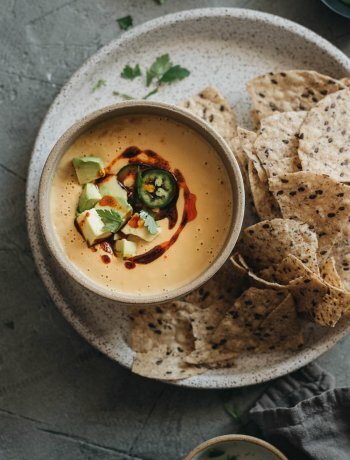 There are a few components that make the sauce delicious, but they can be summed up in terms of veggies, herbs, and enhancers. 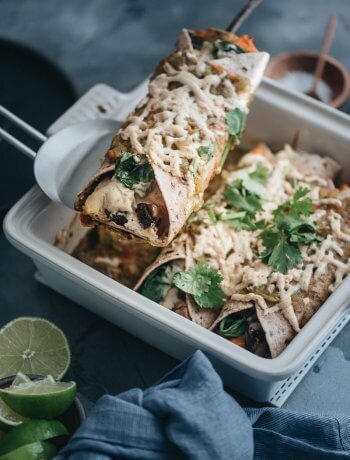 The vegetable ingredients include onion, carrot, celery, eggplant, mushrooms, and lentils. The variety here creates a very well rounded flavor that just tastes savory. And there is the added bonus of nutritional diversity, too. The veggies are sauteed by themselves and then stewed with the rest of the ingredients. This makes it so that some of them get very soft (eggplant, mushroom) while others stay somewhat firm and give the sauce some toothiness. The herbs include fresh garlic, basil, thyme, sage, and parsley. They are mostly added fairly early in the cooking process and mellow out as the sauce simmers. They add to the roundness of the overall flavor of the sauce and make it more fragrant. You can some fresh herbs to garnish your finished dishes and it will add a whole other layer of flavor depth. There are a few different enhancers used to help the sauce pop – miso, soy sauce, white wine, and bay leaf. The miso and soy sauce elevate the other ingredients in similar ways. The glutamates they contain do that really effectively. The wine works slightly differently – I used it to deglaze the pot after sauteeing the vegetables, boiling it down until it’s completely evaporated. This helps collect the caramelized flavors left on the pot by the sauteed vegetables. It also makes the sauce slightly fruitier. Bay leaf adds a hard-to-describe aroma to the sauce that somehow makes the overall flavor more balanced. I also included some shelled hemp hearts for extra substance and texture. And unsweetened, unflavored plant milk for a subtle creamy sweetness to balance the tartness of the tomato sauce and paste. The recipe calls for dry white wine, but you can use red wine instead. The flavor will be very slightly different but the overall effect of flavor enhancement will be there. You can skip the hemp hearts if you like. They are sort of an added bonus. The recipe makes enough for four servings. I recommend making a double batch if you have any doubts about the quantity being enough. The sauce freezes well and may get eaten faster than you expect. If you’d like to make the sauce into a creamy version, you can add the cashew cream from my creamy vegan mushroom pasta (cashews, plant milk, nutritional yeast, optional dried mushrooms). Start by adding half of the mushroom cream, stirring, and tasting it. This may turn the sauce pink. 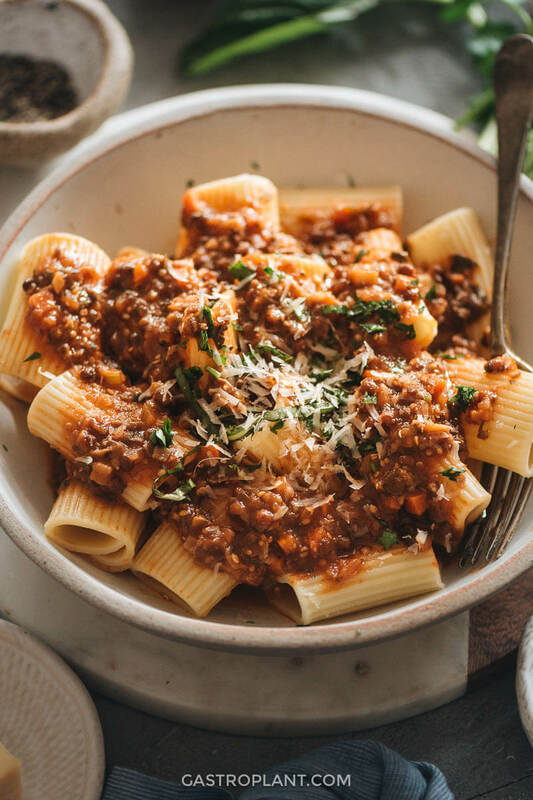 I try to steer clear from processed meat replacement products in my recipes, but if you’re interested in one, the “hot Italian” sausage from Beyond Meat is delicious and pairs perfectly with the sauce. Despite the name, this sausage is not particularly spicy. Just grill some up in a skillet over medium heat, slice them, and add some to each serving of pasta. It’s OK to be generous with the olive oil in this recipe. I tend to add a bit more, maybe an extra half or one tablespoon, and it adds to the richness of the sauce. It’s also OK to add more mushrooms than called for. They shrink down a lot once cooked and will make for great flavor. The recipe recommends mincing or dicing the vegetables (onion, carrot, celery, eggplant, mushroom) into very small pieces. 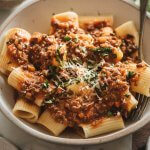 This helps create imitate the “ground meat” consistency of the original bolognese. If you prefer not to do so much chopping, and you’re OK with larger pieces of vegetables, you can just slice them. You can use a food processor to mince the vegetables as well. This will save some time and energy but will produce a slightly different consistency (the pieces will be smaller and less distinct). 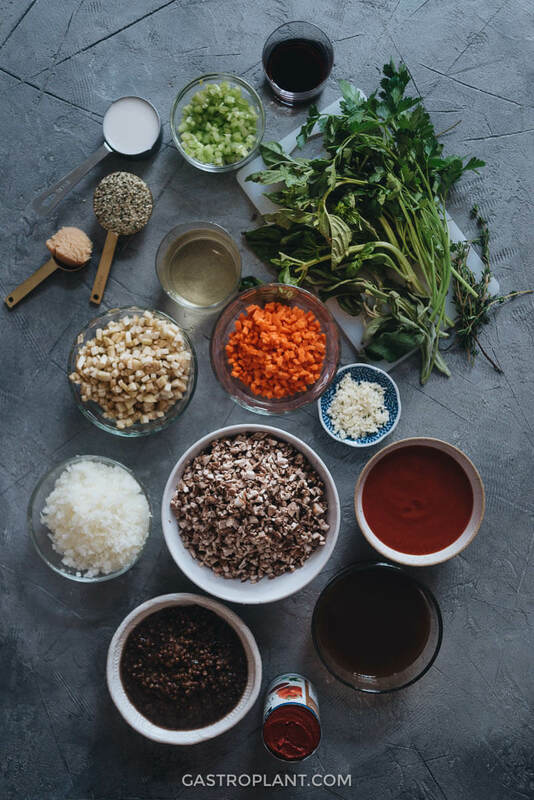 This take on the classic red pasta sauce uses a variety of veggies, lots of fresh herbs, mushrooms, and lentils to unlock a ton of flavor. And the texture is thick and meaty enough to coat whatever pasta strikes your fancy. Heat olive oil in a medium saucepan or dutch oven over medium heat. When the oil is hot, add the garlic, onion, carrot, celery, and eggplant. Saute for 3 minutes, stirring continuously. Add the mushrooms, continue to stir for another 4 minutes. Add the chopped herbs and cook for 3 minutes, still stirring. Add the wine and bay leaf and scrape up any bits stuck on the bottom of the pot. Cook and stir for 5 minutes, until the wine has evaporated. Add the tomato paste, miso, and hemp hearts. Cook and stir for 3 minutes. Add the vegetable stock, lentils, tomato sauce, soy sauce, and plant milk, again scraping any stuck bits from the bottom of the pot. When the sauce returns to a simmer, reduce to low heat and cover the saucepan. Cook at least for another 20 minutes, up to 40 minutes to develop the flavor. Serve sauce over pasta with any of the optional garnishes. If you have any doubt about the quantity, make a double batch. It’s easy to eat a lot of this sauce. The vegetables can be processed in a food processor to save time. 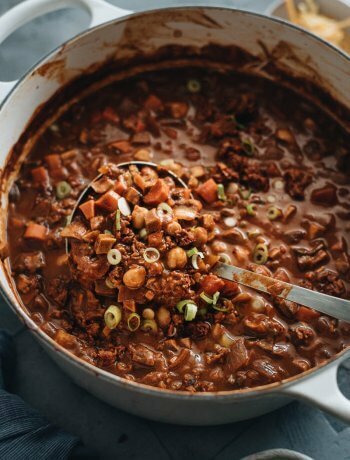 Alternatively, you can just slice the vegetables and achieve a similar flavor, though the texture will be quite different from the intended meaty bolognese texture. You can add slightly more olive oil and mushroom than called for, and it will enhance the flavor of the sauce. You can use red wine instead of white wine. The hemp hearts can be skipped. They add substance and nutrition to the sauce but are not essential.